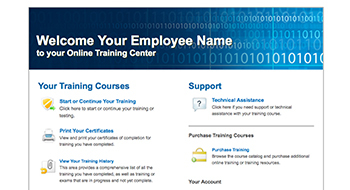 Setting up your free online employee training center couldn’t be faster or easier. Our goal is simple: To help organizations large and small provide critical information security, privacy, and compliance training for their employees - and make the entire process as easy and affordable as possible, regardless of size or budget. Start today - Train today. 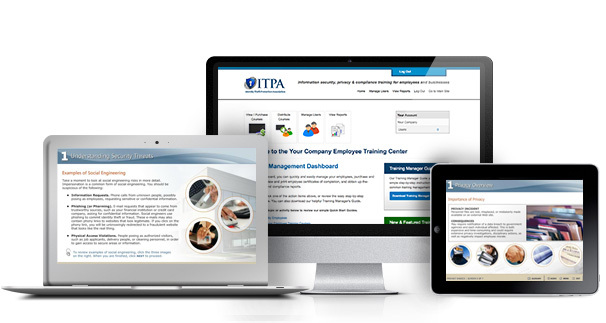 With a free employee training center account, in one minute or less you can quickly and easily establish your organization's own complete online employee training center, with the training courses you need and full compliance tracking - fully functional and ready to use. 60 second set-up - ready to use immediately! No need to purchase, license, or configure expensive learning management systems - save thousands! Train employees 24/7 - online, on-demand, anywhere! No upfront costs, no subscription fees, and no minimums! Select the training you want to provide your employees. Your only cost is for the training you actually use! 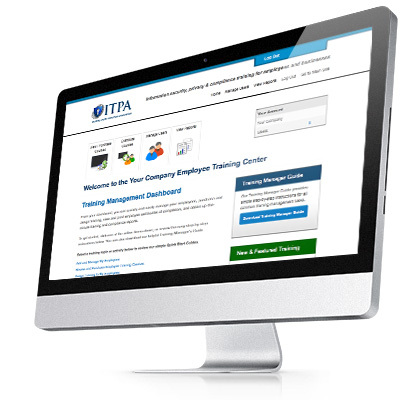 Our unique online training center allows your organization to deliver and manage world-class employee training, regardless of size. Stop struggling with your compliance training and the costs of multiple solutions and over-priced systems and training providers. Our training center includes the employee training your organization needs for information security, privacy, PCI awareness, HIPAA, Red Flags Rule, and more. Do you have turnover or seasonal / temporary employees? Purchase training credits in advance to take advantage of volume pricing. Your credits do not expire and can be used to immediately assign training to new hires when needed. 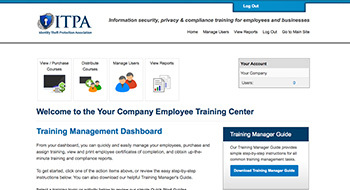 Your training records for every employee are retained for ongoing compliance tracking. Do you have a lot of employees? We can set them up for you and save valuable staff time. And... with our volume discounts and enterprise pricing, the more you train, the more you save. Have your own courses or materials? Our SCORM compliant LMS can be leveraged to host your internal training materials as well. Contact us for details. Information security risks are real. Your employee training should be as well. You have to provide it, but information security, privacy, and compliance training are more than check box items on an audit sheet. In today's world, they are critical components of managing organizational risk and protecting your clients and customers. We believe that if you expend time and resources to provide employee training, it should be effective, impact behavior, and produce results. Real training for real results. Our professional training courses are engaging and interactive, and follow sound, established principles of adult learning. Real world scenarios, knowledge checks, and assessments reinforce and validate learning. The end results are informed employees who are better prepared to make information security and privacy protection decisions that lower risks to your organization and help protect your clients and customers. An entire library of available courses in one location allows you to provide the training you need to address multiple requirements. Provide employee training for information security, privacy, PCI security awareness, HIPAA, Red Flags Rule, and more. You can even expand on your basic requirements with additional security training for remote and mobile workers, address employee social media and BYOD (bring your own device) concerns, or provide certification exam preparation. Start delivering real training that produces real results. No more ineffective Powerpoint training with walls of text and clip art that only put your employees to sleep and wastes time and resources. Your employees will thank you, and your organization will benefit from better trained employees. We know "time is money", so the training center is easy and intuitive for your employees. They can log in, view, and complete their required training from anywhere, 24 hours a day, with just an internet connection. Instant certificates of completion are provided upon successful completion, and we provide support 365 days/year if they ever have a problem or question. Don't let the price (free!) fool you. 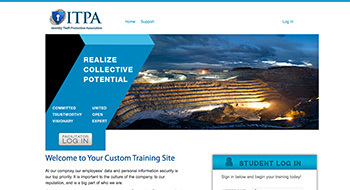 We know the ability to easily track, manage, and document your employee training is critical. Our SCORM compliant training center is powerful and robust, with all the tools you need, but is designed to be simple and intuitive for even the most novice training managers. No more struggling with over-priced or complex training systems that are difficult to use and only add more time and expense to your training budget. Our training center dashboard puts everything at your fingertips, and makes training management and compliance tracking a breeze. We even eliminate the expense and need for your staff to provide training support, with 7/365 support for your employees included! From the Training Management Dashboard, your training manager can easily manage employees, assign training, and run live, up-to-the-minute training reports for compliance. All primary training management tasks are quickly accessed and performed. Quick Start Guides, training manager support, and other helpful resources keep your training program running smoothly. 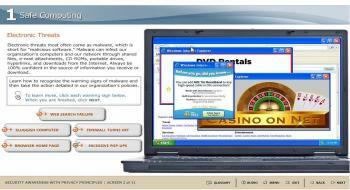 A complete training library of engaging and interactive training courses is instantly available. Select and assign the training you want your employees to complete. Volume discounts and enterprise pricing are available on most courses. 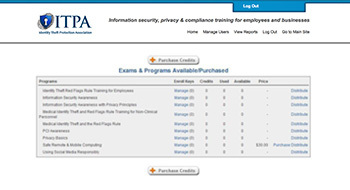 Buy training courses as needed, or purchase training credits in bulk for even greater savings. The Reports Dashboard provides instant access to employee training reports, training history, certificates of completion, compliance reports, and more! 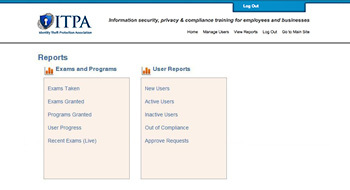 View live training and compliance reports on individual employees, groups of employees, or your entire organization. Annual training required for compliance? Many regulations mandate annual compliance training for your employees, and our training center makes it easy to stay on top of your required training. 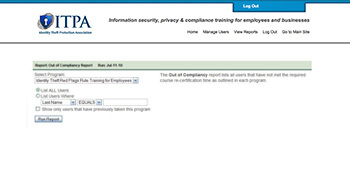 The built-in Out of Compliance report lets you instantly know which employees need to complete training. Want your own completely dedicated online training center, with your own URL and fully branded for your organization? Need customized training materials or delivery solutions? Contact us to discuss your unique training needs.